I very lovingly refer to The Greeting Farm kids as big headed kids. I love love love them. I, too, have a big head and I'm happy that there are a line of stamps for people like me. ;) I'm only kind of joking, my head really is abnormally large. Ok, so this first card is for the Oh, Alice challenge (something under the sea) and for the Wee Memories challenge (a summery card). This is mermaid Anya. Confession: I haven't colored with Copics in a LONG time so I'm super rusty. The paper here is Basic Grey's Euphoria. I used my trusty Labels 1 and some Waterfall Stickles. ETA: This card was made using the Card Positioning Systems sketch for this week. My second card is for The Play Date Cafe Challenge. The challenge is to use lime green, purple and lilac. Look at me, I'm actually getting my cards in before the deadline these days! I'm pretty darn proud of myself! This is a Wild Sprout from TGF named Dahlia. The DP is Kaisercraft Lilac Avenue and the ribbon is from Target $ Spot! Have a great day friends! Again, please forgive my coloring as I try to get more practice. Beautiful art and colors, luv these funny people! You are so funny Ash. Big head, lots of brains, right?! Love your cards! The cards are fabulous. I just love these stmaps. These are so sweet and cute, Ashley! Love TGF images.. Thanks for joining us at the Play Date Cafe!! A perfect contribution to the Oh, Alice! undersea challenge. She is so cute! Have you seen the new Alice movie? I kept thinking about the rebel's code phrase - "down with the bloody big head" talking about the mean red queen!!! Charming card! fantastic cards! Love the big headed kids and thanks for joining us at Oh, Alice this week. Adorable! Love the sweet image and the background is perfect for the challenge. Thanks for playing along with us at the PDCC! Aw, SO cute and your colouring is fabulous! Thanks for playing along with us at the PDCC this week! What sweet images, what a great use of the CPS sketch. Mermaid Ayna is sooo cute, love her! Love your DP as well, it works beautifully with your card! Thanks so much for joining us over at Oh Alice! 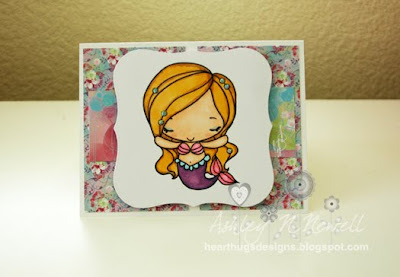 Super cute cards Ashley!! I dug out my "big head" kids for the Oh, Alice challenge this week. They are one of my all time favorite lines of stamps! Thank you for joining us this week for the Oh, Alice Challenge!